Enjoy these fun galaxy facts for kids. Learn how about all the different types of galaxies in the universe, the Milky Way Galaxy that Earth sits in, the Local Group of galaxies we are part off, how many galaxies there are in the observable universe and much more. Read on for a range of interesting facts about galaxies. The word 'galaxy' is derived from the Greek word galaxias which means "milky", it is a reference to our own galaxy the Milky Way. 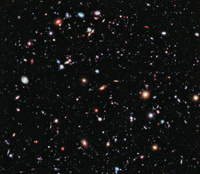 There are potentially more than 170 billion galaxies in the observable universe. Some, called dwarf galaxies, are very small with about 10 million stars, while others are huge containing an estimated 100 trillion stars. Based on shape astronomers have identified various kinds of galaxies including, elliptical galaxies, spiral galaxies, lenticular galaxies and irregular galaxies. Spiral galaxies are rotating flattened disk-shapes with at least two spiral arms of newer stars extending out from a central bulge of older stars. The dense molecular clouds of hydrogen gas and dust in the spiral arms of spiral galaxies are areas of intense star formation. Barred spiral galaxies (like our Milky Way) contain a long bar in the middle with spirals arms coming off the ends. Around two-thirds of spiral galaxies contain a barred structure in their center. The Hubble classification scheme, lists spiral galaxies as type S, with an 'a', 'b', or 'c' depending on how tight the spiral arms are and the size of the center bulge. Barred spiral galaxies have the symbol SB. Spiral galaxies are believed to be younger than elliptical galaxies, as spiral galaxies burn through their gas and dust star formation slows, they lose their spiral shape and slowly evolve into elliptical galaxies. Elliptical galaxies are a mass of stars bunched together in the shape of an elliptical disk. Elliptical galaxies are often larger, very old and contain little gas and dust, so therefore form very few new stars. The Hubble classification scheme identifies elliptical galaxies with the letter E, followed by a number representing the degree of ellipticity. Lenticular galaxies (S0 symbol) have a bright central bulge with a disk-like structure but, unlike spiral galaxies, the disks have no spiral structure and are not actively forming many stars. Any galaxy that has no obvious spiral or elliptical structure are called irregular galaxies. Some irregular galaxies would have just formed that way while others are the result of other galaxy types crashing into each other. Our Milky Way Galaxy is a barred spiral galaxy about 120,000 light-years in diameter containing up too 400 billion stars and possibly just as many planets. Our Solar System is located within the disk of the Milky Way Galaxy, around 27,000 light-years from the Galactic Center of the galaxy. Our Milky Way Galaxy is part of a 'Local Group' of galaxies in which the galaxies move relative to each other. The Andromeda Galaxy is the largest galaxy of the Local Group, followed by the Milky Way and the Triangulum Galaxy, there are around 30 other smaller galaxies in the group. Galaxies often collide with each other. Usually, the stars within each will move past one and other due to the vast space between them. Any gas clouds and dust will interact, forming new stars. Gravity can pull the galaxies into new shapes, two spiral galaxies might join into a new elliptical, others produce bars, rings, or tails. Starburst is a name for galaxies that form a lot of new stars at a fast rate, usually after much molecular cloud is produced as two galaxies merge.